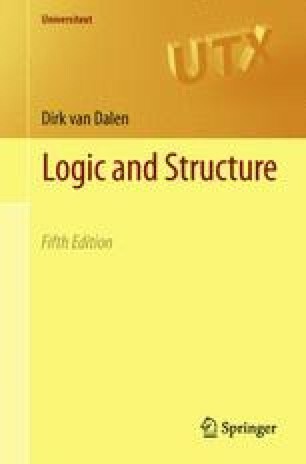 The treatment of propositional logic, and of all following logical systems, is firmly based on a precise and systematic introduction of its language and syntax. Simple as the language may be, the reader will benefit from the systematic use of inductive and recursive procedures employed in this book. It would be hard and inconvenient to establish important properties of the language with a mathematical precision without recourse to the suitable induction principles. As a rule it is a rewarding experience for newcomers to see that what should be the case in formal logic, can indeed be simply proved. The semantics of propositional logic is based on the traditional truth values 0 and 1 (false and true). A rich variety of important and useful principles are established with surprising ease by inductive means. On the whole, the reader will be surprised how much milage one gets out of a well-chosen methodology. Once the notion of truth is made clear, one turns to formal proof methods. The system used here is Gentzen’s Natural Deduction. If ever the adjective “natural” was well chosen, it was here. Natural Deduction allows students to concoct their own derivations without any intricate tricks. Even the completeness theorem—true = derivable—becomes simple in the present setting. Here and in all later chapters, numerous exercises present the reader with occasions to apply the given tools.